The genus Alocasia is one place to look if you are in search of the ultimate lush tropical garden. Unfortunately, so many of the most desirable species are also too tender to grow for very long in temperate gardens. With that in mind, I began hybridizing Alocasias with the objective of producing hardier, easier to grow tropical specimens for all gardeners. This hybrid is one of the newest I've developed. 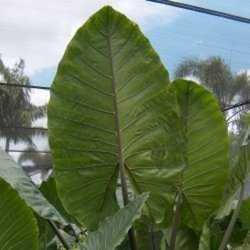 If you love the look of the tropics, the large-leaved plants known as "Elephant Ears" are a must for your garden. 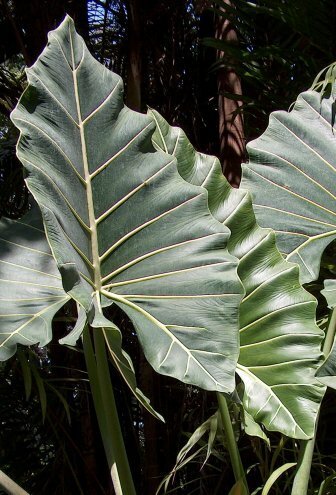 What could call to mind the warm tropical breezes and lazy endless summerlike days more than the lush leaves of plants like Xanthosoma, Colocasia, and Alocasia? Growing plants like these in a northern or temperate summer garden is sure to lead to zone envy, especially when you see how large they can grow in their native climate! I have longed for the tropics ever since my teenage years and aroids have been prominent in that longing. My fascination with these plants has led me to develop newer, hardier, and more interesting varieties of Alocasia. Alocasia 'Imperial Giant' is one of my newest, and is also one of my most enigmatic due to one of the parents I used to produce it. There's no mystery about the other parent. 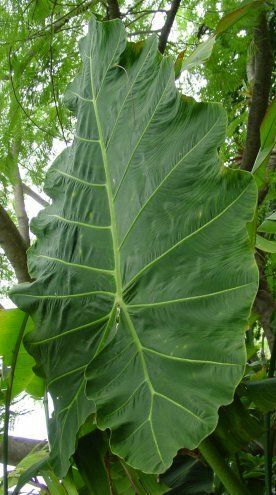 Alocasia macrorrhizos 'Borneo Giant' (below, left), is popular amongst those tropical gardeners who wish the largest possible Elephant Ear for their gardens. This plant has almost everything going for it, except that it is, well, green, all green, and no other colors. So when the opportunity to cross it with pollen from a very interesting plant whose only name I could find was 'VangiGo', I jumped at the chance. 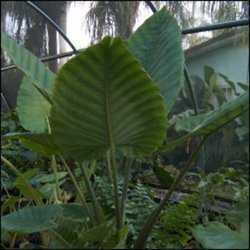 You see, Alocasia 'VangiGo' is either an undescribed species, or is a hybrid of unknown parentage. All the sleuthing I have done has shown me only that the plant was named after an Aglaonema hybridizer, a Ms. VangiGo, and that the plant came from the Philippines originally. The story is that a plant was obtained, placed in tissue culture, a hundred or so produced, and these then distributed at one of the annual sales of the International Aroid Society years ago. Nearly all of those plants ultimately perished, including those retained by the nursery which first obtained this plant. I was fortunate enough to learn about a person who had a blooming size specimen, and this individual was gracious enough to allow me access to pollen for my work. Regrettably, since then this plant has also perished, but not before I was able to use the pollen in not one, nor two, but three successful hybridizations. The delicate nature of many of these most desirable Alocasia plants is the main reason I work to blend them genetically with hardier stock. I must recount, however, what this extraordinary Alocasia looked like because then you will know why I was so excited to be able to obtain pollen from it. When I first laid eyes on the VangiGo, I was stunned. 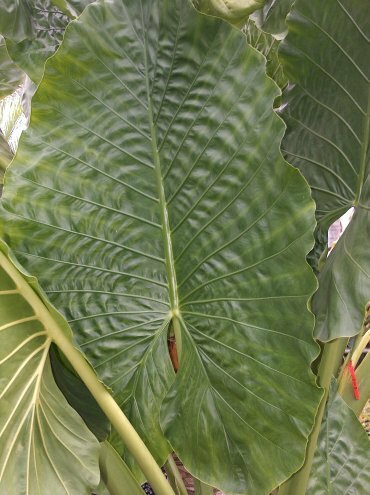 I had seen Alocasia 'Sarian', a plant with heavy textured leaves and bold white veins (below, left). This plant looked like 'Sarian' on steroids because in every way the VangiGo was larger, heavier, and thicker. The newly emerged leaves had bold creamy white veins and the leaf texture was almost like cardboard, with very prominent smaller veins on the underside of the leaves. With age, the vein color faded to a light green. VangiGo petioles were mottled with a brownish coloration, holding the phenomenal leaf blades that were easily 5 feet or more in length (picture at right). But what was most exciting to me was the abundance of pollen on the inflorescences. I began imagining what kind of progeny I could obtain by crossing this plant with the Borneo Giant. 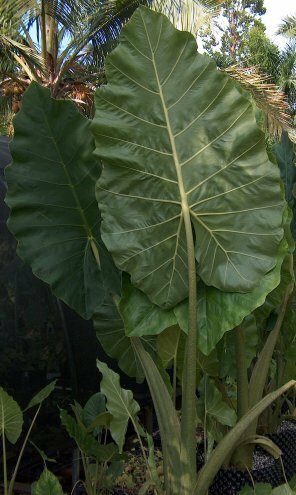 Alocasia 'Imperial Giant' is one of the results of that hybridization. This baby will be big! Alocasia 'Imperial Giant' appears to have retained the best of both of its parents. It has heavy textured leaves, mottled petioles, produces abundant offsets, and most importantly, promises to grow to quite a large size at maturity (see young plant pictured below, right). So far my specimens are not yet mature enough to bloom, yet they have already attained impressive dimensions. The one thing they do lack is the creamy white veins on the newly emerged leaves. This winter I have discovered that they are somewhat sensitive to colder temperatures when young, although the more mature specimens seem to have a greater resistance to chilling injury. So I am not finished with this one, as I plan to bring in additional hardiness by crossing it with Alocasia odora. I know I can do this because I have already produced hybrids between the VangiGo and Alocasia odora. Alocasia 'Borneo Giant' and Alocasia 'VangiGo' have inflorescences with very similar morphology, which hints to me that their hybrids stand a decent chance of being fertile. Alocasia 'Borneo Giant' is not the largest plant I have had the opportunity to work with. 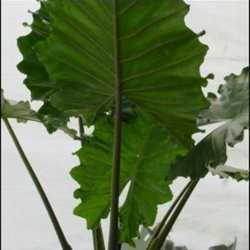 A plant that is practically a legend among aroid enthusiasts is Alocasia robusta. This is a plant whose difficulty in growing is rivaled only by the lust with which gardeners are driven to try growing it. I've felt that pain as I've tried and lost my share of these plants. However, I've done something about it. As spectacular as Alocasia 'Imperial Giant' is, it is just the beginning because something much bigger is on the horizon. Watch for it!